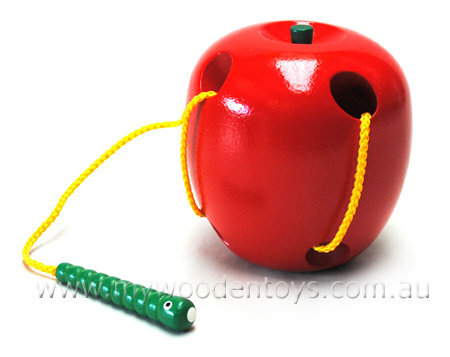 Wooden Lacing Apple With Worm is a lovely, bright red, round, threading and lacing toy. A great toy for testing those fine motor skills, the game is to thread the green worm in and out of the multiple holes. The holes go right through the apple so you really have to use those little fingers to get it all the way through. Material: Wood, Child-safe paint, Cloth leaf. We like this because: "It looks good enough to eat and is great fun when the worm disappears and reappears on the other side"